So you feel like you’ve got a pretty good handle on macro photography. You got the right lens and settings. Now you’ve got to find a subject. Do you know what you’re looking for or even what you’re looking at? Knowing your fish and invertebrates and where you are likely to find them will put you at a distinct advantage and help you to get that great shot. As a fish identification instructor for the Reef Environmental Education Foundation (reef.org) I teach people, through online courses (fishinars,) simple memory clues for the many different fish you might see on a dive. This, of course, is just the beginning of knowing your underwater surroundings and finding the macro subject you are looking for. Our first example is an extreme juvenile of a Bluehead Wrasse (about an inch), commonly known simply as a Bluehead. The first thing you will notice is that the fish does not have a blue head. That is because only the adult male fish has a blue head. Juveniles always have a yellow head and a spot on the dorsal fin. The most common behavior of all Wrasses is that they are rarely still and are constantly in motion so quite hard to get a good photo of. Finding this one resting in a Pink Azure Sponge for a backdrop was one of those shots begging to be taken. Knowing the common behavior of the wrasse and that what I was seeing was uncommon gave me even more of an advantage when choosing my shots in my limited time underwater. Our second example is from the Socorro Islands in the Pacific. While most of my fellow divers were taking video and photos of Giant Mantas and Hammerheads (and I did get a few wide-angle shots myself) I was finding unusual shots like this. Looking among the many large, long-spined sea urchins (be careful I came up with a spine all the way through my fin!) you will find many juvenile fish and great macro opportunities. 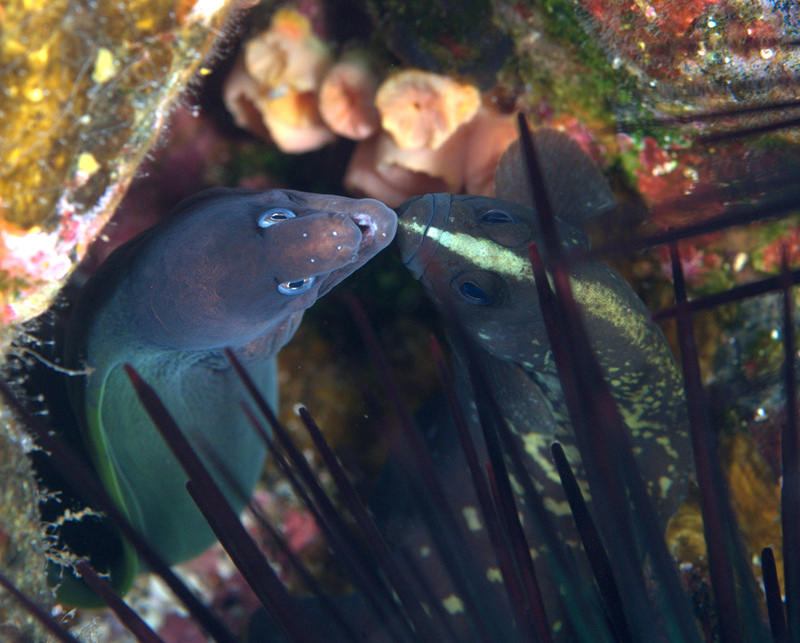 This shot is of two extreme juveniles one a Panamic Green Moray Eel and the other a Mottled Soapfish. The way they have balanced the shot with their synchronistic positioning to each other and how they seem to be touching chins is an example of the other thing you need when taking good underwater photography: luck (just keep shuttering!). Again knowing the individual animal’s behavior lets you know that this is an unusual shot. As adults the Moray would certainly make short work and a quick meal of the Soapfish if given the opportunity. However as juveniles they are just hunkering down together for safety. For our next couple of photos let’s look at some Slender Filefish. 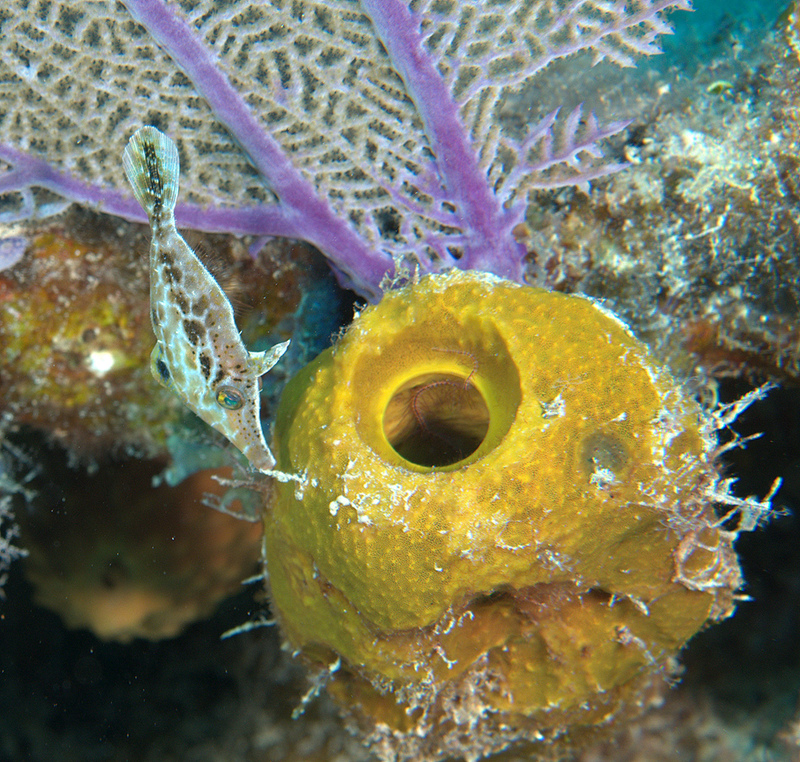 I’m sure for those of you who have dove the Caribbean that you are familiar with the larger Filefish: the Scrawled Filefish which is circumtropical, and the Whitespotted and Orangespotted Filefish which can be seen on most dives in warm Atlantic waters. 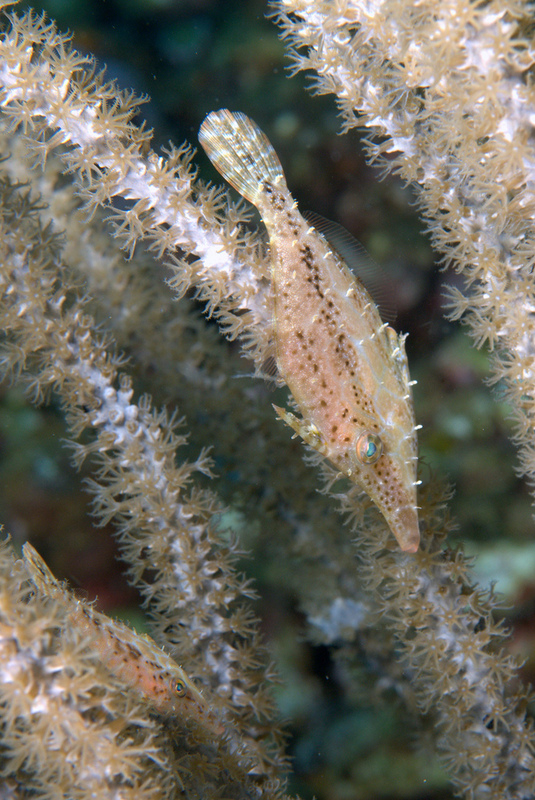 The much smaller Slender Filefish can be found on the top of wrecks or reefs, in plenty of light, usually floating nose down among branches of gorgonians. While this shot is interesting and typical of their behavior the next shot shows the kind of shot you can get if you spend a bit of time playing cat and mouse with them. The key, of course is to be as unobtrusive as possible which is not easy when you outweigh your subject by hundreds of pounds and are constantly spewing bubbles. 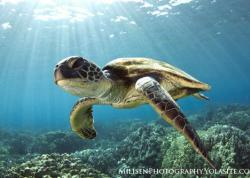 Buoyancy control, minimal movement on your part and anticipating the animal’s movements are all skills to be mastered. Other things to look for in the behavior and location of animals are color contrasts in their surroundings and personification in their “expressions”. 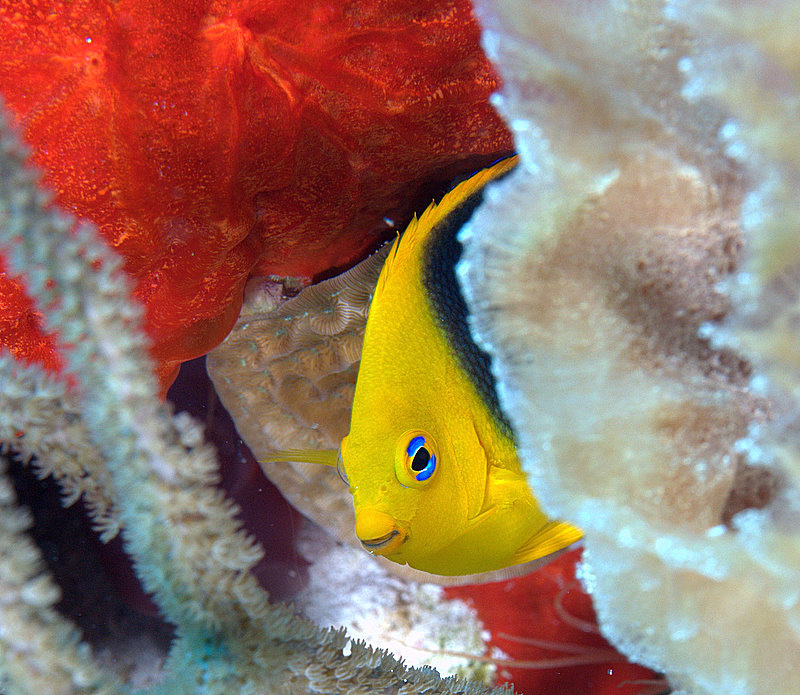 The yellow and black colors of the Rock Beauty Angelfish contrasts nicely with the red and pearly white colors of the surrounding sponges. The three quarter view as the fish peeks out (behavior typical of the Rock Beauty) also adds to the composition. The element that most strongly connects us to the image, however, is the “smiling expression” and “eye contact” that the fish seems to be making with the viewer. Framing due to the animal’s habitat and position of the animal can also add a great deal to a shot. This juvenile Red Irish Lord in a little cavelet with the shadow on the back part of the body and the face well lit creates a nice mood to the photo. 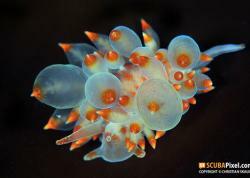 Even invertebrates can behave in ways that we can associate with. 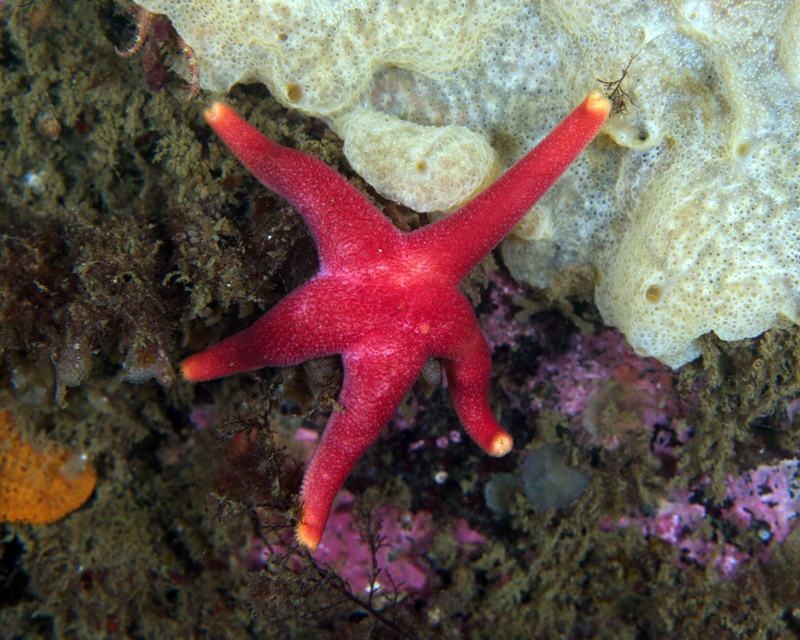 The Northern Blood Star appears to be reaching out to grab a tiny piece of algae which adds a story and drama to the shot. Typically you do not want to take a shot head on of an animal. Three-quarter view followed by profile view is recommended. 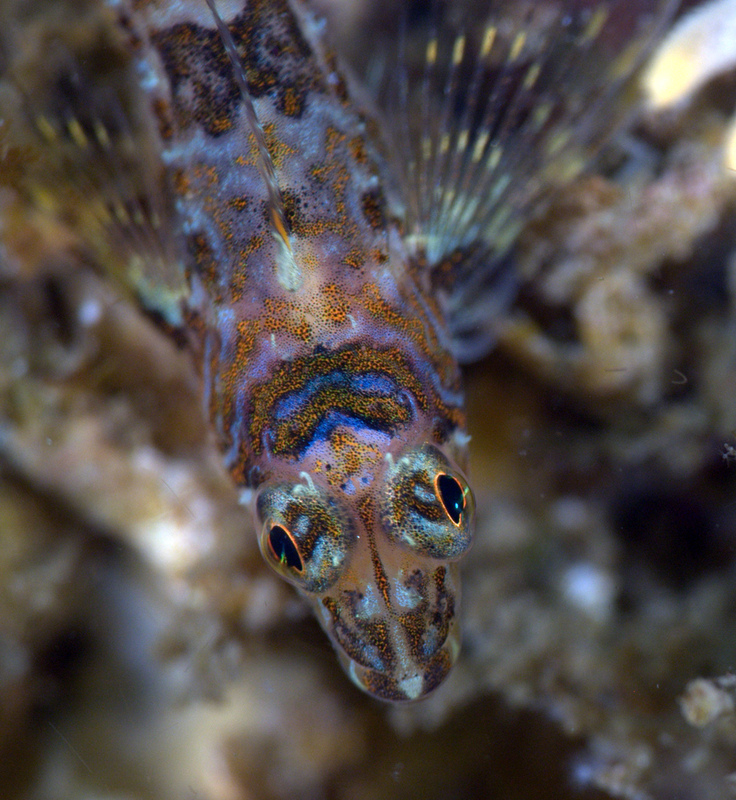 However, in this straight on shot of a Mexican Barnacle Blenny the fish has so much “expression” that the viewer can’t help but identify with it. 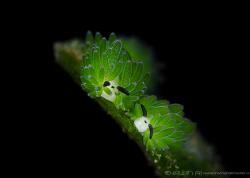 This photo was chosen by PADI as one of the finalists for the image on their 2013 PADI Dive Society card. 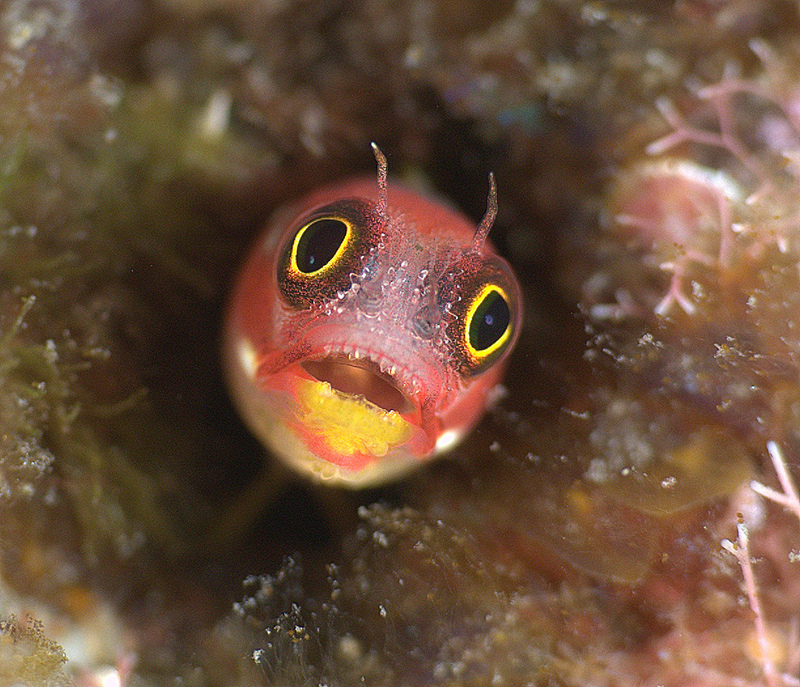 It was the only macro image out of ten finalists chosen out of thousands of international submissions so the “expression” of the fish obviously affected the judges. Finally, when looking for macro opportunities: dive slowly. Sometimes I will spend the entire dive in perhaps a twenty foot square area. 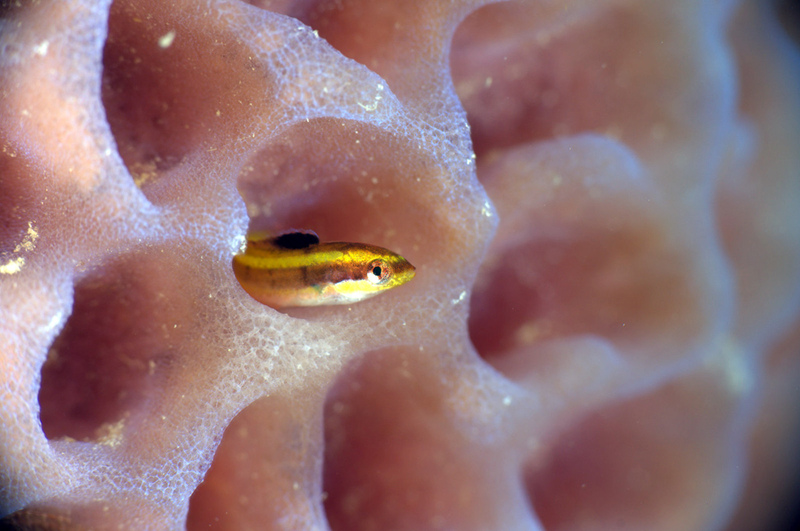 Blennies, Gobies and other typical macro fish and invertebrates tend to be fairly sedentary which gives you an opportunity to get real close without them moving off. Look carefully and from many angles, you never know what you might find. 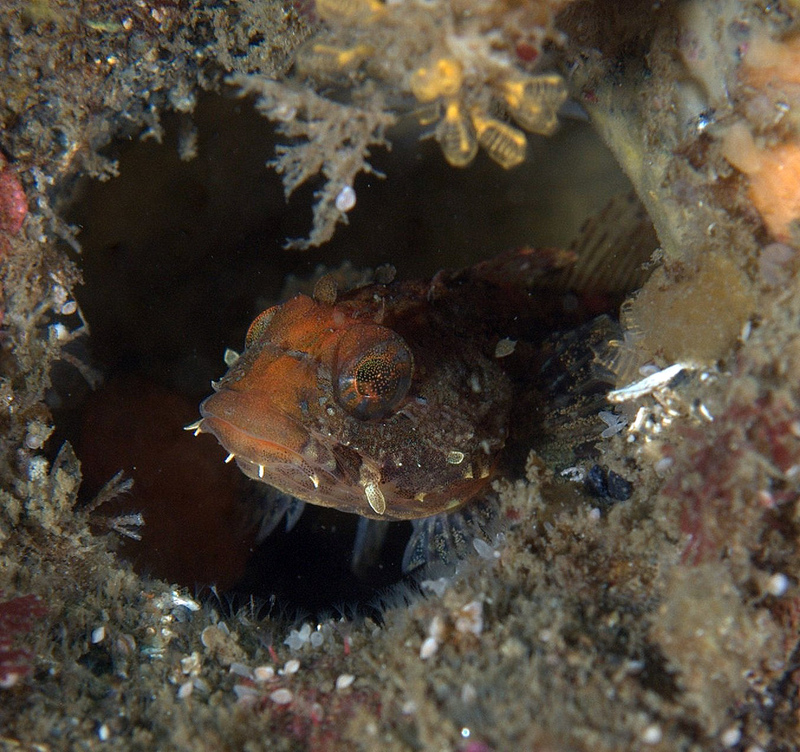 I used a 60mm lens and a ReefNet 10+ magnifying diopter mounted to my flat port to get the overhead face detail of this Longfin Sculpin off Cape Flattery near Neah Bay Washington. To sum up the more you know about the behavior and habitat of an animal and the slower and more carefully you dive the better macro shots you will get. Diving while adventurous and invigorating can also be full of tiny moments that are just short of heaven on earth and can bring us to a truly tranquil and wonderful place in an otherwise hectic existence. It is great to be able to share these moments with the world. Jonathan Lavan is the owner/operator of Underpressure Diving and Photography and an online fish ID instructor for the Reef Environmental Education Foundation (reef.org). He shoots with a Nikon D300 with a 60mm or 105mm lens in a Subal housing, a ReefNet 10+ magnifying diopter, Ikelite 125’s or 160’s for strobe and a Light & Motion SOLA/PHOTO 500 focus light. He can be reached at jonathan_maureen@yahoo.com. His work can be seen at www.underpressurephotographybest.blogspot.com. Submitted by Anonymous on Fri, 2012-12-07 03:42. That Mona Lisa Rock Beauty is one of my all time favorite fish photos. So much charm!